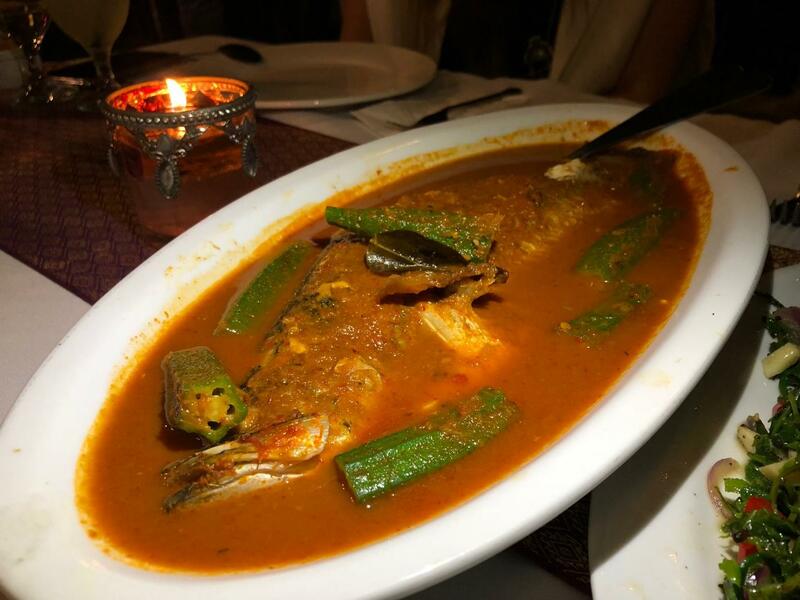 Songket is tucked away in a quiet corner of Jalan Yap Kwan Seng. I’m a huge fan of Malay food. From the little road side stalls to Malay fine cuisine, I love it all. Due to availability, of course, I have the former more often than the later. While I love my street food, it’s nice every now and then to enjoy a meal in a nice cosy restaurant setting. 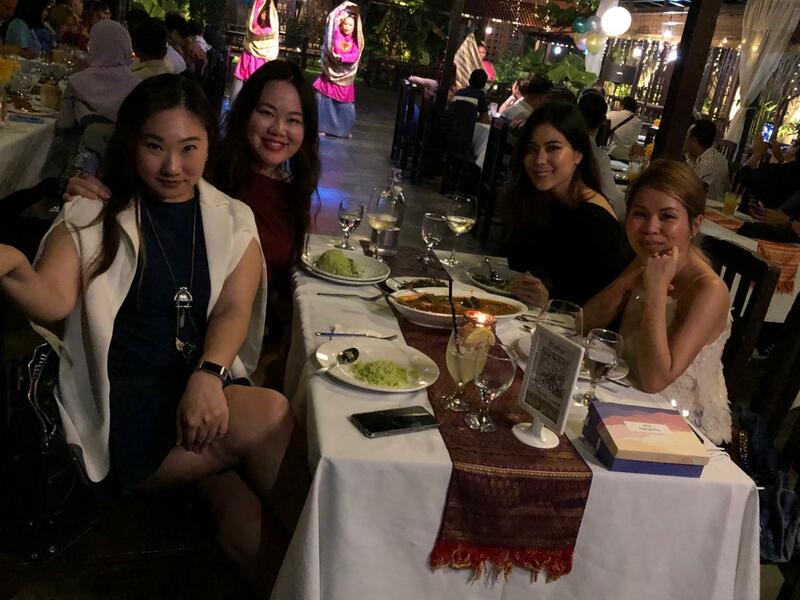 As my friend said she knew a nice Malay restaurant in town which would be perfect for a little get together we were planning amongst girlfriends, we all agreed to meet up over dinner there. 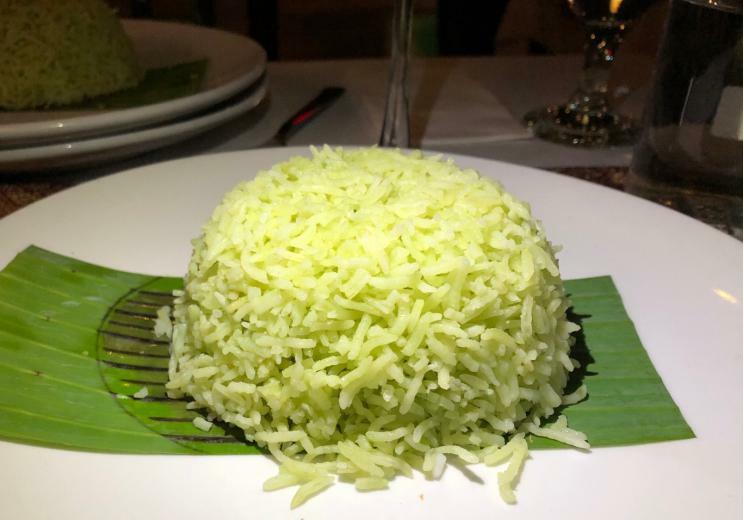 I was looking forward to enjoying a nice intimate meal with my friends and when I turned up at Songket restaurant, I knew I had come to the perfect place . 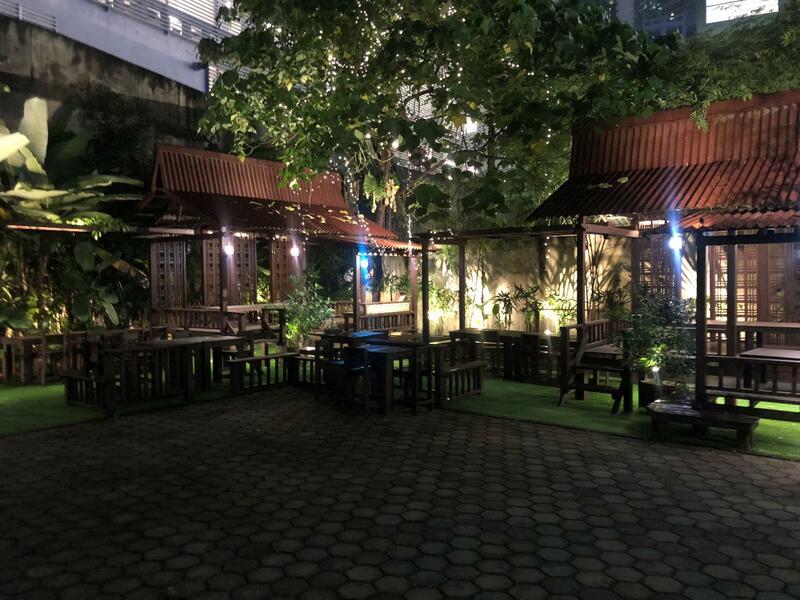 The lush garden area at Songket is beautiful at night decorated with fairy lights. Songket restaurant has quite a large indoor and outdoor space and yet the whole restaurant feels really warm and cosy with a friendly vibe. Guests have a choice to dine indoors or outdoors on the veranda or private kampung house styled gazebos. 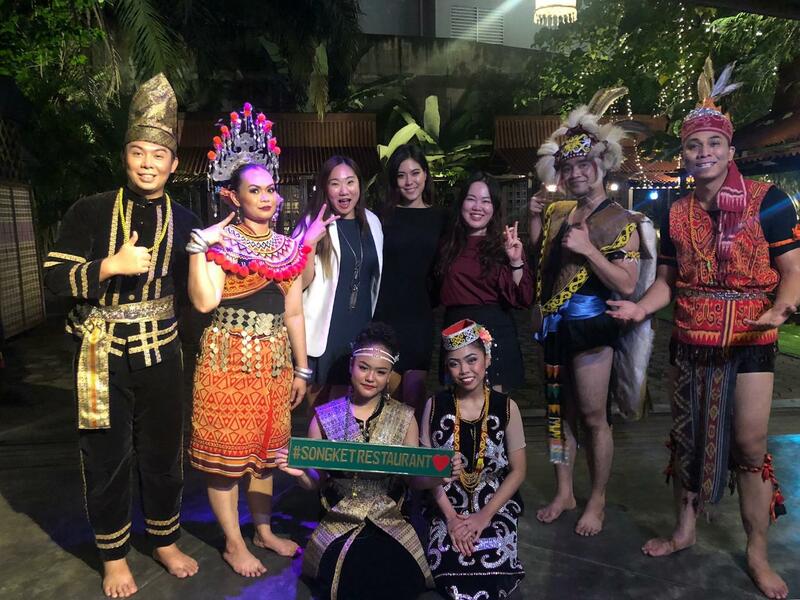 The outdoor area would be a good choice in the evenings when the weather is cooler and also to enjoy Songket’s cultural performance which takes place Monday to Saturday from 830pm to 915pm. We came on a Tuesday night so we had the dancers entertaining us during our dinner. The performance is basically a medley of cultural dances from all over Malaysia. It’s a great ice breaking activity as well, as diners are invited to participate in the activities. I got pulled in for the “Magunatip” or Sabahan bamboo stick dance, which was a lot of fun! I was too afraid to try the blowpipe but some of the guests had fun popping balloons with them. 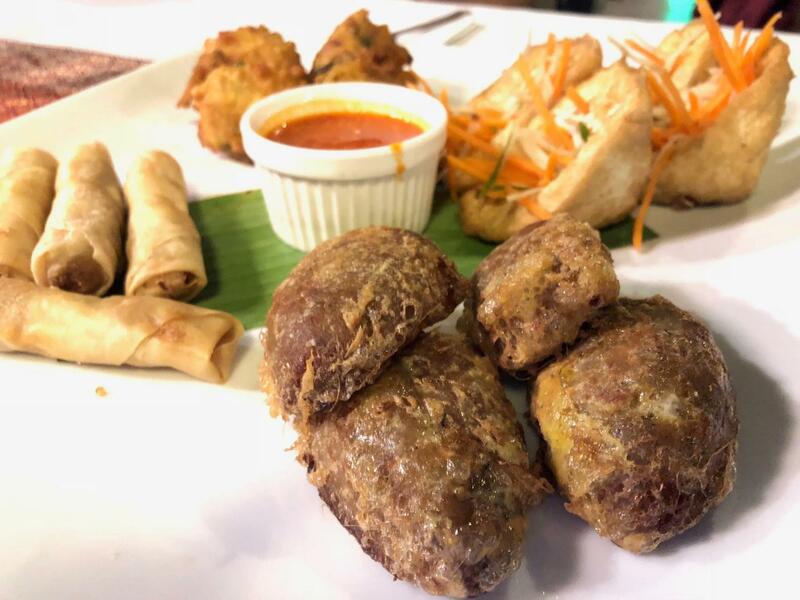 We started with the Songket Platter (RM 35) which had Begedil, Cucur Udang, Fried Popiah, and Tauhu Sumbat. 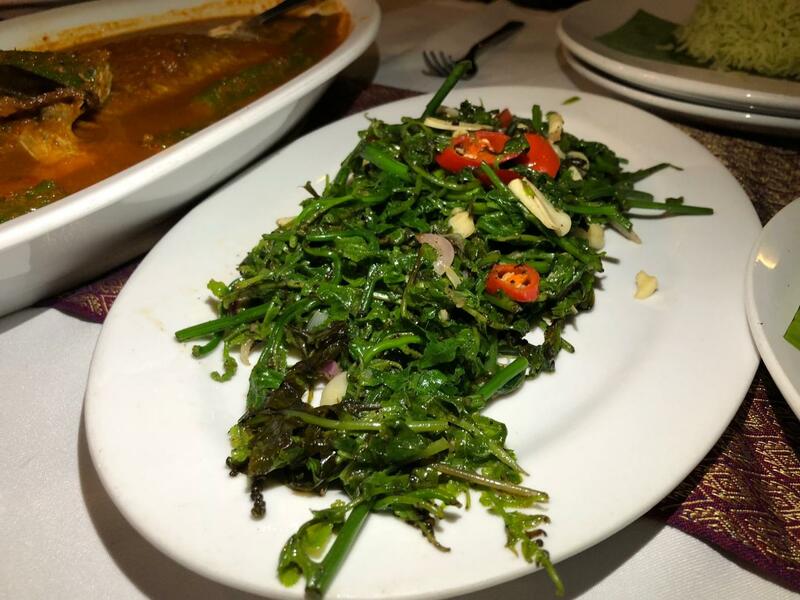 The menu at Songket is vast with Malay dishes from many parts of Malaysia. I loved the diversity of the menu which offered plenty of options yet stuck true to authentic Malay cuisine. We were very happy with our choices that day though some of us who like our food extra spicy found that while the food was well flavoured, it lacked a little bit of heat. We were told that it was to cater to the foreign patrons who might not be used to eating as spicy as Malaysians. We did have sambal on the side though so we could add on the spice according to our liking. Dessert at Sogket was to die for! 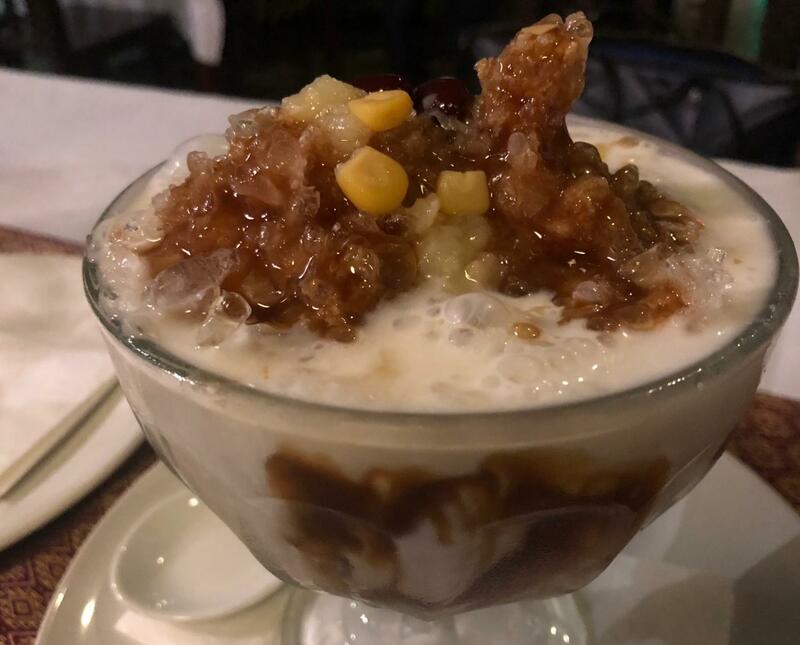 We were quite full so we planned to only share two desserts between the four of us but the Cendol and Sago Gula Melaka were so good and there were so many dessert options on the menu, we thought it would be a sin not to sample at least another. 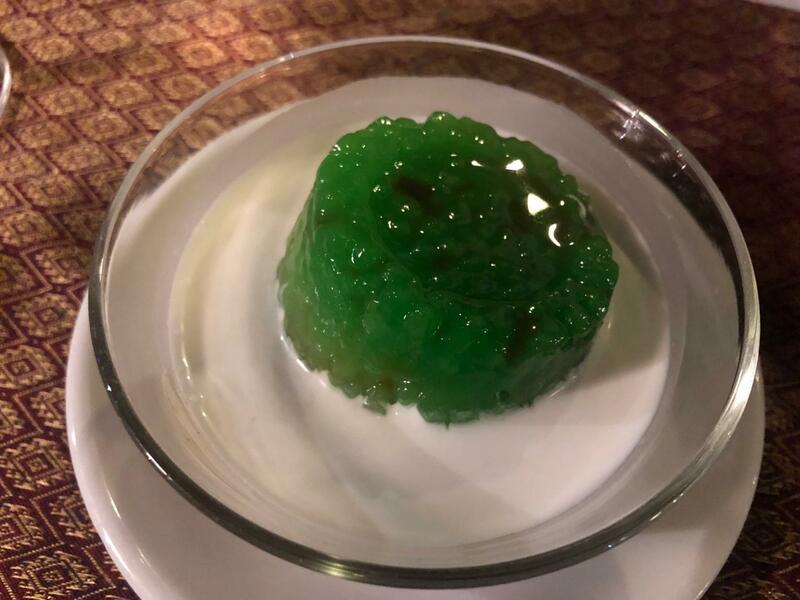 We were told the Sum-Sum Pandan Gula Melaka was one of their most popular desserts so we ordered that and my goodness was it good! It’s one of my favourite local desserts but I’ve never had it this way. 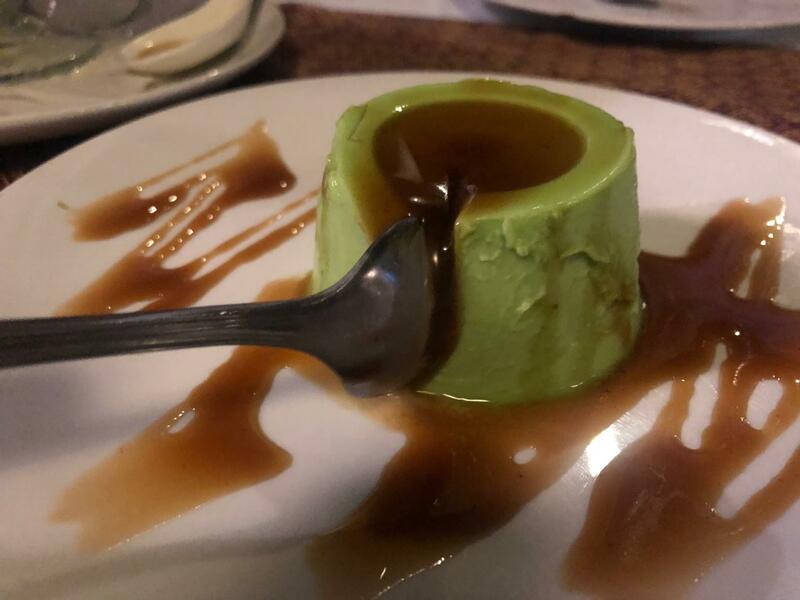 It was like a pandan flavoured Panna Cotta with gula melaka. Despite having a large meal and two desserts before it, we still managed to finish it! A picture with the dancers after the performance that night. 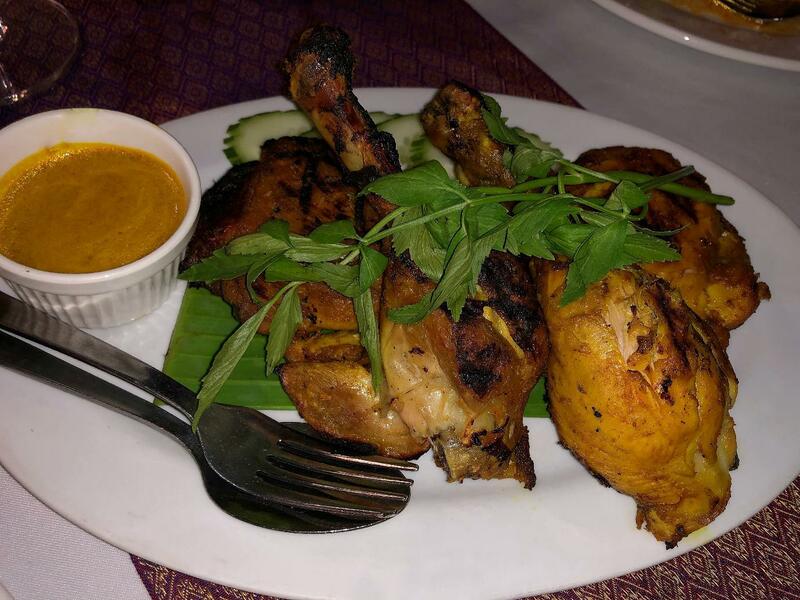 All in all, it was truly a delightful evening at Songket. Great ambiance with good food and entertainment. 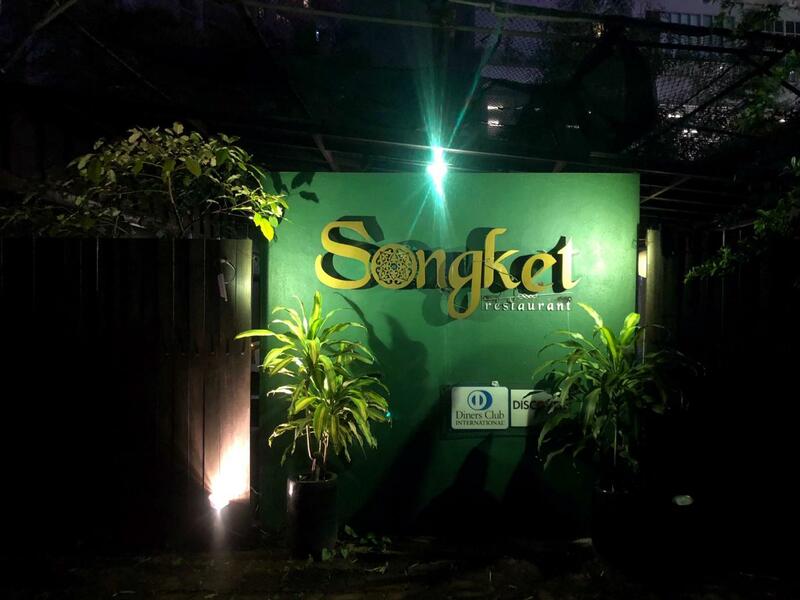 Songket is an interesting place because it’s a very nice intimate setting for a quiet dinner, and yet it’s also perfect for large groups as we saw a few big groups dining in that day. I imagine it would be alright to bring kids as well, with the large compound, restless children will have no problem entertaining themselves. 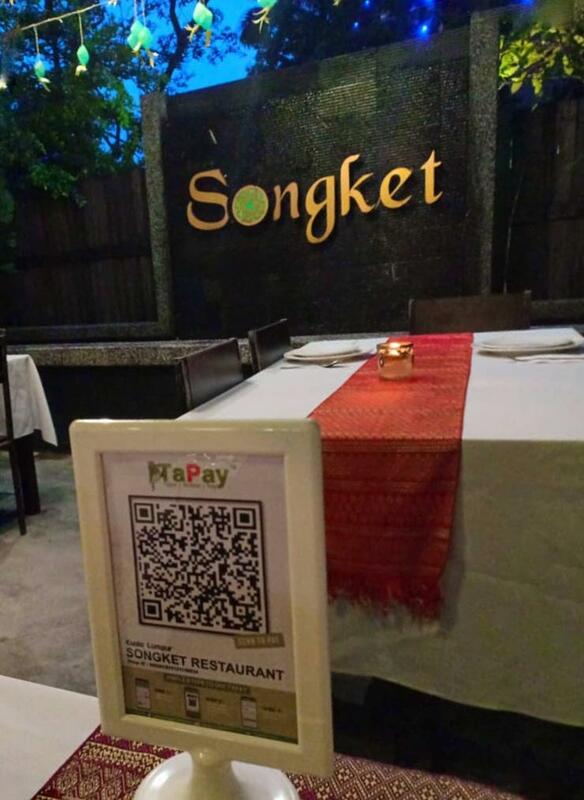 Dining in Songket is a fantastic local culinary and cultural experience for tourists and locals alike.